Netflix Comes To The Wii! Hey Wii owners, have you ever been mockingly asked “so can your Wii play DVDs yet?” Respond proudly because, thanks to Netflix, now it can do even better. Owners have indubitably learned to settle for less since the console’s raw power lacks in comparison to the competition. A few good games, the Virtual Console, and Wii Ware add more value for the, but it still struggles to compete with other consoles when it comes to handling multimedia. Veterans of the console and more experienced players will definitely be glad to see the Wii spreading its wings and building on its potential. 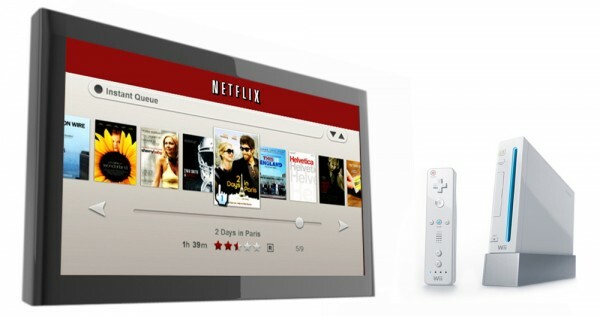 A new agreement between Nintendo and Los Gatos based Netflix will bring streaming movies to your TV through a Wii. The service will be available in the United States this spring at no additional cost. That’s if you are already a Netflix member, own a Wii, and have a high-speed internet connection. Netflix will be quite excited to have this new distribution medium since it’s the best-selling console on the market. Plus, the Xbox 360 and PlayStation 3 already have access to the movie rental service. With the cheapest Netflix membership starting at just $9 per month, the option to both watch streaming movies at anytime and receive DVDs in the mail is a bargain. To get started, you’ll need to request a free Netflix instant-streaming disc. As with the PlayStation 3, the special Netflix disc needs to be in your Wii to gain access the Netflix service. The Xbox 360 is the only console with built-in dashboard integration. Nintendo claims that the Netflix experience on the Wii should have a native feel. Customers can navigate through the user interface using the Wii’s remote controller to browse through categories, popular genres, new arrivals, or even view their instant queue. In the battle of next-gen consoles, the Nintendo Wii has its own unique attributes. The console focuses on family gaming entertainment than anything else. With that said, it does have a handful of excellent games that could only spawn forth from Nintendo. Unfortunately it does seem a bit out of its league when put up against Microsoft and Sony. The Xbox 360 and PlayStation 3 have a larger gaming library and can also double as a household’s entertainment device since they can handle high-definition content. The Wii is trying to makeup for lost ground for the time being, but as new upgrades reach the other two consoles, it will likely be left in the dust. Struggles to compete with the other consoles? By struggle you must mean double-their-sales. Hahah excellent point Curt. Although the Wii proves to be quite a money-making gem I only meant in terms of handling multimedia and lacking “raw power” in comparison to other consoles.